Merry Christmas and Happy Holidays! I'm happy to share with you all my first ever Christmas quilt! This quilt features the beautiful Vintage Holiday fabric by Bonnie and Camille for Moda and the brand new Square Dance quilt pattern from LellaBoutique. One of my favorite parts of the entire quilt is the silver metallic dot background! It just makes the whole thing sparkle! Finished "Square Dance" quilt, 70" x 70"
This quilt finishes at 70" x 70" and features a gorgeous edge-to-edge long arm quilting design called Swirly Snowflakes. I could not be more happy with the way this quilt turned out and I am so excited to have our first Christmas quilt finished and ready for the season. Thanks for reading this brief blog post / updated and checking out my latest quilt. I hope you all have a wonderful holiday season and spend quality time with friends & family. When did you make your first Christmas quilt?? What pattern and/or fabrics did you use?? Hey all! I thought I'd pop in and share some of my Christmas makes (so far) that I've been working away on for a couple weeks now. Some of these are custom orders from my Handmade Shop, others are gifts for family / friends. Below are some fun and colorful photos for you to checkout of my recent creations. Check captions for links to patterns! (if there is one). What are you making this holiday season?? I'd love to know! Custom Small Popcorn Pouches for makeup! 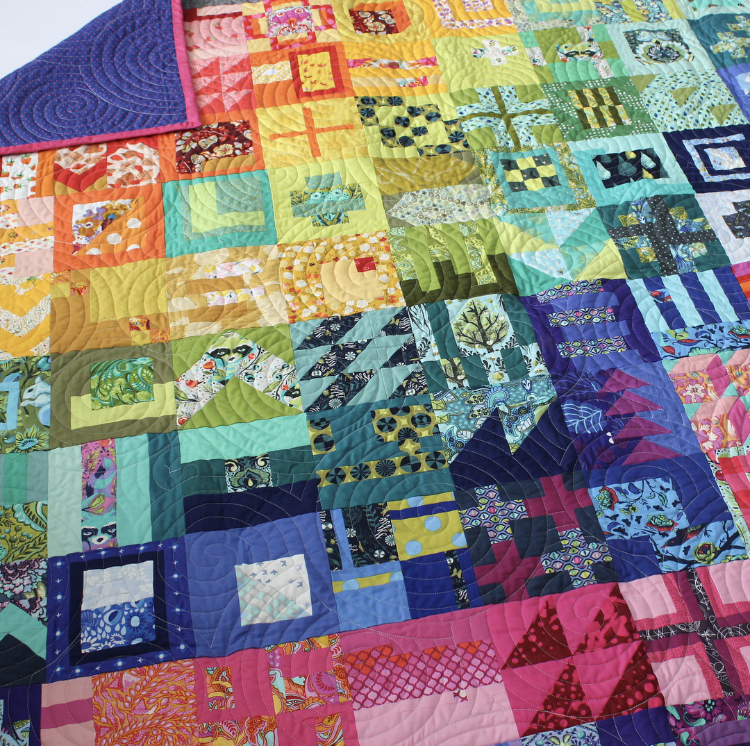 I am so excited to share with you my finished #100blocks100days2018 project - the rainbow Tula Pink City Sampler quilt! This was a long and drawn out process that I have to admit I agonized over a bit too much, lol. The color choices for each block took longer than they should have, but I really just wanted everything to be perfect! The full finished quilt (below) was really a labor of love for me. I enjoyed piecing all 100 of those 6" little blocks. Finished quilt 70" x 70"
The border for this quilt is Moda Crossweave in Black, one of my favorite deep charcoal fabrics. It has such great texture. Not to mention this beautiful quilted design called "Raindrops on the Pond" done by Quilting by David is one of my favorites I've had put on a quilt ever! As far as the design layout goes, I let my 10 year old daughter help me place each block and told myself I would NOT agonize over the final layout and just let it be! I Actually really love the way the top came together, it almost has a "burst" design with the rainbow exploding from the top right corner and onto the rest of the quilt, almost in a curved way. Does that make sense? I really love it! I used a large variety of Kona Solids and prints from Alison Glass, Tula Pink, Lizzy House, Heather Ross and more. Surprisingly, a quilt this size and with so much variety and such small blocks really does not use much of your stash at all. I had plenty to choose from as most blocks can be made with large scraps. The label is one I printed myself at home using June Tailor Printable Fabric sheets. Each sheet has fusible backing so you can easily iron your creations on to your projects after printing from your Inkjet printer. I was surprised at how crisp and clear they came out. If you would like to see each individual block I made for this quilt, feel free to visit the hashtag #amistascitysampler on Instagram or browse my feed @amistabaker - I posted every single block for the 100 Days challenge! *This post contains affiliate links. If you purchase via the links provided I will earn a very small commission, but you will not pay more! These commissions help me do what I love, thank you! I have loved seeing all the amazing makes on social media made from my latest pattern, the Popcorn Pouch. Today I'm here to share with you some fun little hacks to make your Popcorn Pouches more fun. First, if you're looking for the pattern you can purchase it on Payhip at any time! It comes in 4 sizes and each one lies flat or expands anywhere from 1" to 2.5" (depending on pouch size) to accommodate all your stuff! First, you'll need the Popcorn Pouch Pattern. Add iron-on vinyl to your pouch exterior and/or interior fabric pieces to make your pouch water resistant and wipeable! Add a tab + key ring (or D-ring) to any size pouch and make a matching key fob to attach to it for easy traveling. Use a single piece of transparent or glitter vinyl in place of exterior and interior fabrics to create a see through pouch. Use a single piece of Kraftex 'fabric' to create a faux leather pouch. Instead of using a woven interfacing, simply make a quilt sandwich with your exterior fabric and batting and quilt as desired, then assemble. Add a few inches to the length of your fabric cuts to create a deeper pouch. Make an entire set of 4 pouches and nest them together to create a fun gift! Do you have your own hacks? If you're an avid bag maker I'd love to know what other hacks you like to use when making pouches. I am always trying to find new ways to create a bag and make it my own. I think this pattern is perfect for stocking stuffers, swaps, and so much more. What would you use your Popcorn Pouch for? Share your Popcorn Pouch creations by using #popcornpouch on social media! I've got a brand new pattern being released today, the Popcorn Pouch! These super easy to sew bags come in 4 sizes, can lie fat or expand up to 2.5" in depth, and have seamless linings! They really are great for all sorts of things and are easy to store or travel with. CLICK TO BUY THE PDF PATTERN! Today I'm popping in to share with you yet another pattern I recently tested for the wonderful Aneela Hoey! This one is called the Sunflower Tote and it pairs one of Aneela's beautiful embroidery patterns with a simple but large tote bag pattern thats perfect for the market, the library, or quilt shop and so much more! I started off by embroidering this tote with some Aurifil floss and 12 wt. threads in a range of berry shades (with a little orange thrown in). One of the embroidery designs was knew to me, but luckily Aneela includes helpful instructions and illustrations for each stitch. Everything is very easy to understand and the tote pattern itself is super simple and straight forward. As you can see here, I've got a quilt in this tote... a TWIN SIZE quilt... and there's still room to spare! It's very roomy but also light weight and easy to fold up and store. I'm relatively new to embroidery, I definitely would say I'm an expert but I did pick it up quickly and throughly enjoy it. Hand stitching was something I never thought I could master! Do you like embroidery or have you ever thought of trying it? Hello and HAPPY OCTOBER! My favorite month of the year! As a new 2018 Aurifil Artisan, one of the most requested posts my followers asked for were comparisons on the different weights of Aurifil and why they are better quality than the typical store bought thread. All thread information can be found at Aurifil.com, but I have broken it down for you in shorter, easier to understand terms and put it all in one place. I've also included some stitch examples and I have recently published a trouble shooting guide if you're having issues with thread wether in hand stitching or machine sewing so check that out as well! If you're here for the info on Aurifil keep reading! Aurifil is 100% Egyptian Cotton grown in the MAKO region of Egypt on the River Nile. The thread production process begins Milan, Italy where it goes through a 15-step process before completion. Aurifil thread is mercerized which is a process that not only strengthens the thread but also provides it with a beautiful sheen. Below are the lists and brief summaries of each Aurifil thread type / weight as well as links to color charts that are available. Cotton 80 Wt. available in small spools only in 88 colors. Forty3 - Long arm thread cones in 50 colors. Aurifloss - 6-strand embroidery floss available in smalls spools, 270 colors. Wool - (50% Wool, 50% Acrylic) in small and large spools and cones, 192 colors. Poly Longarm - Variegated cones in 10 colors. Monofilament Invisible - 2 shades available in large spools and cones. Bobbin - 60 wt. large spools in white. Side note: Needle selection is just as important as thread selection. Checkout this great guide for pairing the right machine needles with different thread weights. Most of you will already know a little about thread weights and how important they are to each project you're making. Below is a direct quote from Aurifil.com about how their thread weights are determined, and since I couldn't write it any better (and they're the expert on their own threads, lets be honest LOL) I've included it here. Many Aurifil thread weights work for the same purposes. I have done countless EPP (English paper piecing) blocks in 80, 50, and 40 wt threads. I just grab whatever color is right, in whatever weight I own that specific color. They are all great for hand piecing, you just have to choose what your preference is. Just remember, the higher the weight, the thinner the thread! When it comes to quilting or top stitching, my personal preference is either 12 wt, 28 wt, or 40 wt thread. They all give a great defined stitch. Below are the thread choices from Aurifil and the best uses for each product. 50 wt. - Piecing and providing super flat seams, and for quilting or hand sewing, appliqué, and all sorts of machine sewing. Wool - Cross stitch and hand embroidering, machine appliqué and quilting, serging, long arm quilting. Bobbin - Umm... the bobbin! :) Pairs well with many different top thread weights. Did I miss something? Have a question? I'm all about learning new things. If you believe I missed something or even have a question please don't hesitate to comment below. Whew! This was a lengthy post. However, I did get lots of requests for this sort of content from newbie quilters on my Instagram and Twitter. I hope I've helped in some way. Please stick around and follow my blog and social media accounts for more posts like this including upcoming giveaways and tutorials! Have an awesome day! Admittedly, I'm new to the world of solids. I refused to use them for such a long time that once I finally got to them I felt like I didn't know what to do LOL. Now I love them, and thanks to @cloudtori I came across this amazing curated bundle of Neon Kona Solids shades that Im totally obsessed with! It was a pretty popular post of mine on Instagram, with lots of DM's asking me the names of the solids and where to find them, so I thought I'd share here. 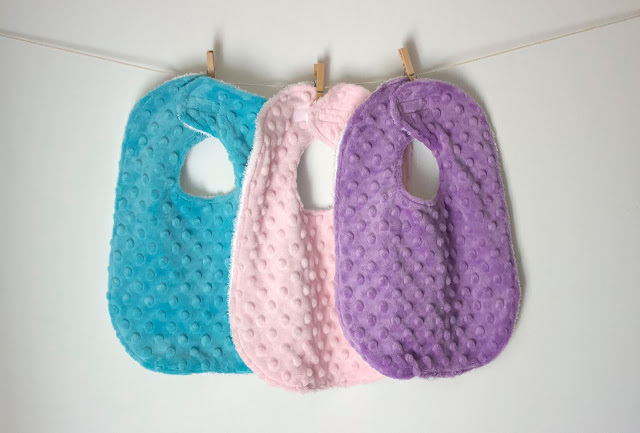 I purchased mine from Fabric Bubb, its my favorite shop to buy solids in the US and they have super fast shipping. Dahlia, Sassy Pink, Orangeade, Cantaloupe, Bright Idea, Key Lime, Azure, and Breakers. Happy Friday! I hope your September is going well so far. I feel like "Summer" was so short, and yet the super hot and humid weather has continued :( I am ready for fall temps and falling leaves! Today I want to share this beautiful 3 in 1 Pouch pattern by Aneela Hoey. I have been testing patterns for Aneela for well over a year now and I am always pleasantly surprised at how simply her bags come together, even for those who may not be skilled in pouches. No templates or printed pieces needed. The great thing about this particular pouch is the simplified construction method. 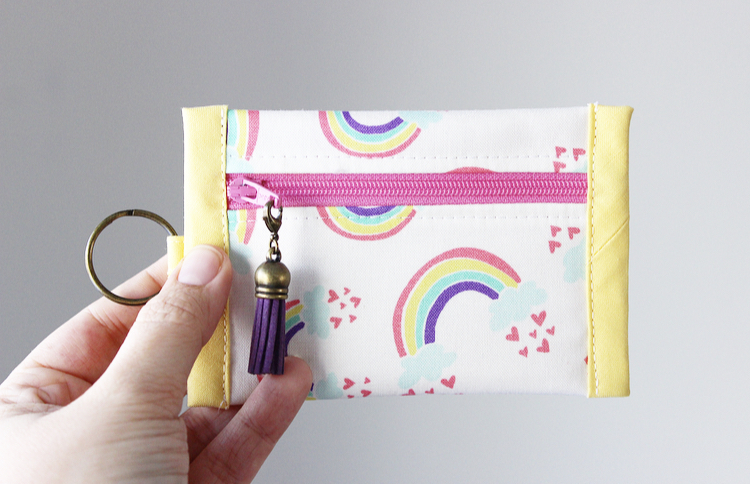 If you're familiar with the pouch similar to this in Aneela's book "Stitched Sewing Organizers", you may have found the origami style construction a bit difficult. This 3 in 1 Pouch is much more straight forward! Overall this is a great unique pattern and would be especially good for crafters, teachers, kids, makeup enthusiasts, etc. It can hold lots of goodies! My version features this beautiful Navy Gingham from Cotton + Steel and a Pat Bravo "Indie Folk" print for Art Gallery Fabrics. I did a small EPP panel with 1" hexes on the front and outlined those with some decorative hand stitching in Aurifil 12 wt. threads. Im really happy with how it turned out and will definitely be making more in the future! Would you purchase this pattern? What do you think of it? If you're an avid sewer, wether it be by machine or by hand, I'm sure you've ran into your fair share of issues. Am I right? Over the years I've learned quite a bit about troubleshooting these issues myself and checking things that I honestly fail to realize may be an issue at first. Left: small spool holder, Right: large spool holder. Nope, it doesn't, I swear! When I first started using Aurifil 50 wt with my Janome 3160 QDC I had tons of issues. I did a lot of research and quickly realized I was using the wrong spool holder! I was using the basic large spool holder that came with my machine, which is great for Coats and Clark spools, but I needed a small version for Aurifil. You'll notice some thread brands come with large gaping spools (Coats and Clark), or small skinny spools (Aurifil, Connecting Threads). The spools are different and so naturally the spool holders need to be different too! 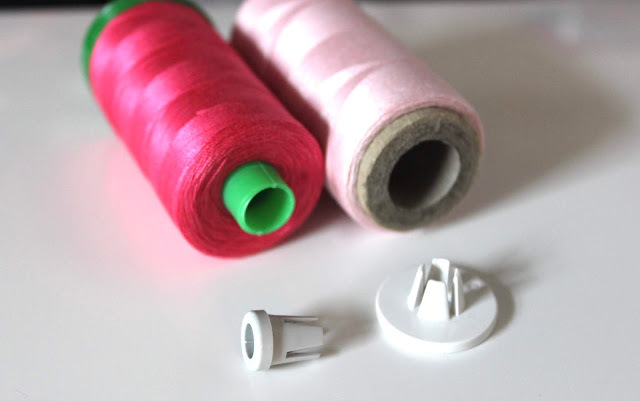 The fix is easy and so cheap - you can grab a 2-pack of small spool holders from Sewing Parts Online for $5.99 (shown in photo above). *Great for horizontal or vertical spool holders! Can also be used with Craftsy and Connecting Threads brand spools. It was an inexpensive fix that allows me to use Aurifil, and other threads with the same style of spool, without issues. Whenever I may use a thread with a larger spool I simply switch back to the holder that came with my machine. Aurifil 40 wt. variegated thread in Marrakesh, using the correct size spool holder. If you're getting frequent skipped top stitches or big bunched up "bird nests" with your bobbin thread there are a few areas you can check to rule out the problem. All of these troubleshooting steps can apply to thread breakage as well. Try them ALL until the issue is fixed! Is your needle bent or dull? It may not always be obvious, but the best way to check is to remove it from the machine and lay it on a rotary mat against one of the lines. If there is any bend at all, replace it. If the tip doesn't seem as sharp as a brand new one, replace it. You should be replacing them after a few hours of stitching anyway :) I like to do so at the start of every new big project. Are you using the right needle? Not all machine needles are compatible with every thread weight. Depending on what thread or fabric you're using, do a little research and find out what size machine needle is best and use that. If you've got multiple layers of thick fabrics when sewing bags, use a heavy duty denim needle. If you're sewing with knits, use a knits needle, so on and so forth. Are you using the right spool holder? This is what we just talked about. It can cause huge tension issues. Make sure you have the correct one! Is your bobbin wound correctly? Yes, there's a right and wrong way to wind a bobbin and if the tension is off when winding it can totally affect you're stitches. Checkout this video for winding a bobbin correctly every time. Is your machine threaded correctly? It happens to the best of us, sometimes you just don't thread the machine right and don't even realize it. Take it out and start over just to be sure if you're still having issues. Make sure the foot is lifted in the "up" position, this is super important when threading a machine! Check the tension. The best way to correct tension for the particular thread weight you're using is to simply experiment. 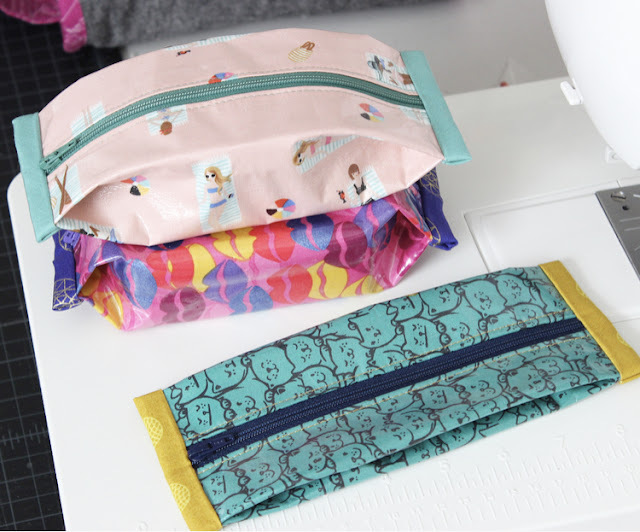 Grab a couple pieces of scrap fabric and some batting, sandwich them together and stitch straight lines, adjusting the tension for each line until you get the right setting. If your bobbin thread is showing on top or your top thread is showing on bobbin, you've got tension problems! Clean your machine! You should be cleaning your machine, changing needles, and re-threading after every completed quilt (or a several small projects). It sounds excessive but you really do need to do basic maintenance that often. I like to pick a day of the week, we'll say Sunday, and designate that as machine cleaning day. Built up lint and thread bits will definitely effect the way your machine operates and can cause skipped stitches, or worse, a broken machine! This is something I've encountered quite a bit since I do some form of hand stitching or English Paper Piecing nearly every day of the week. In order to seriously cut down on any knots while I'm hand stitching, I first and foremost will begin by running my length of thread through a thread wax before I sew. You need the static and waxy coating that the thread conditioners provide in order to keep your thread strands stuck together - it's when they come apart that they begin to tangle and knot during sewing. My thread wax preference is Thread Heaven, but they've since gone out of business. However, there are a lot, and I mean A LOT, of large and small brands selling thread waxes on the internet now. If you'd like to buy from an actual quilter or small business, try Etsy! A second tip is to make sure you're not using a length of thread that is way too long, I like to use one the length of my forearm (finger tips to elbow) or shorter. The longer the thread, the more chances it will twist and knot during sewing. You need a good workable length. I hope this guide troubleshooting guide was extensive enough and helped you if you were having issues. Feel free to comment below with any questions or comments! I will help any way I can. Have an awesome day and Happy Labor Day to all my U.S. readers! Fulk Family Quilt #2: Baby Size! I'm happy to show you the second of the Fulk Family quilts (see the first here), a baby version for Helen's youngest son Henry who is just a few months old now. This quilt was made with donated blocks for the original quilt, and ended up at 36" x 48" which is the perfect crib size! It should be big enough to grow with him well into his toddler / preschool years. I'd like to say a big thanks again to everyone who donated blocks, backing, binding, quilting, time, energy, love, etc. to make these quilts happen after the unexpected death of Helens husband. She absolutely loves them and will cherish them forever! 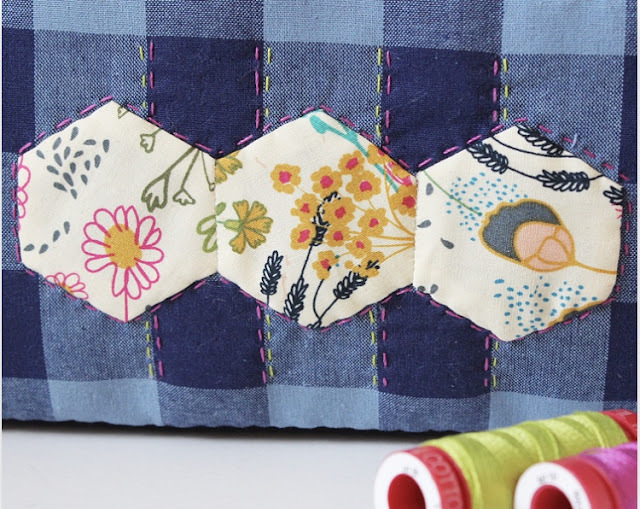 Last week I was a guest blogging on Aurifil Thread's blog, Auribuzz. I'm using Shannon Fabrics Cuddle pinky, Embrace double gauze, and Terry cloth. I'll also be sharing a free bib pattern and tutorial, plus some tips for working with these fabrics in conjunction with Aurifil 40 wt. threads. I hope you'll join us! Click here to visit my guest blog post. Hello all, and Happy August! By now, I'm sure many of you have seen on either Facebook or Instagram that the Fulk Family Quilt is finished, so I wanted to hop on here and share some final images of the finished quilt with you all as well. If you're just finding out about this charity quilt effort, you can read my original post here. I shared the hope of making a quilt for Helen Fulk after her husband unexpectedly passed away in June with people across social media and the response was overwhelming! The finished quilt is 72" x 84" and made from 12" reverse sawtooth blocks (free tutorial by suzyquilts). I chose blue, green, and teal mixed with low volume fabrics when I put out a call for blocks. I think the final look is really cohesive considering they came from so many different quilters! A big thank you to everyone involved in this process. From block making, to donating binding, backing, batting, quilting services, etc! It was a huge group effort that stretched from the U.S. to Canada. It would not have come together so quickly if it weren't for all of you. Longarm quilting, batting, and binding services provided by Megan McCord. Blocks donated by 17 quilters from the U.S. and Canada. Binding donated by SimplyMackbeth on Etsy. Backing donated by Karen Denoya. 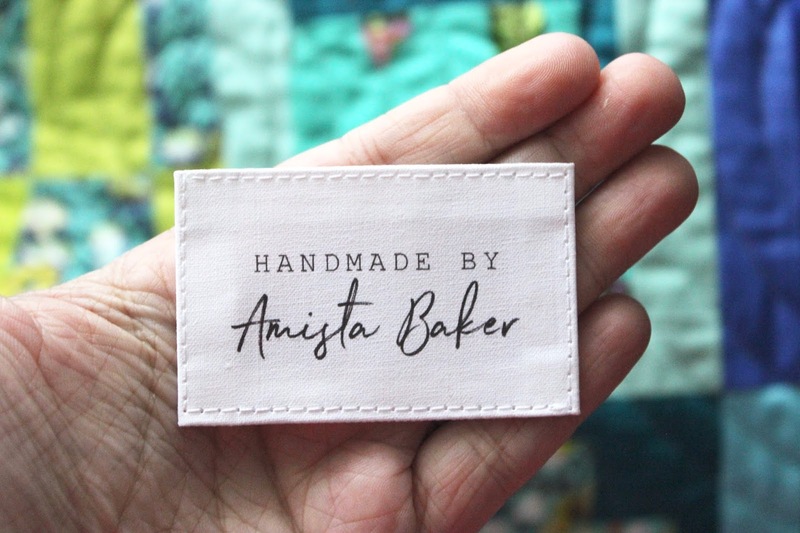 The label was purchased from BorderCityQuilts on Etsy, where I get all of my printed quilt labels. She has so many designs to choose from and is very open to custom orders! This quilt was gifted to Helen and her sons a couple days ago. She was very happy to receive it and wanted to make sure I passed on her thanks to everyone involved.